This is a bit of a continuation of the Ottolenghi fangirl blogging. In the first cookbook, there was a recipe for cauliflower fritters, which were extremely good. Good enough to even convert some seasoned cauliflower haters (not me - I've always liked it, which I think is testament to my mother's cauliflower cheese!). In the vegetarian book, Plenty, there is a recipe for leek fritters, which I must admit I am less enamoured with. The original will always be the best in my eyes. However, I decided to have a play and see if i could achieve a similar effect using courgettes. To my delight they worked, and worked well. The Ottolenghi book recommends stuffing them into pittas, which is delicious. However, I prefer to serve them on their own as a starter, with a helping of tangy lime coriander yogurt. It may look a bit heavy on ingredients, but it is surprisingly quick to make. To make the yogurt sauce, pour 200ml yogurt into a mixing bowl. Finely chop the coriander and add to the mixing bowl along with the juice and zest of a lime. pour in 2 tablespoons olive oil and then crush in one clove of garlic. mix together thoroughly so the olive oil emulsifies with the yogurt, and transfer to the fridge until ready to use. 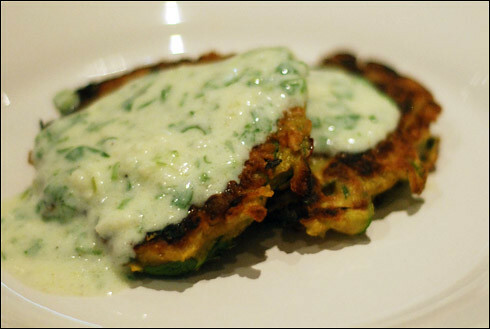 To make the fritters, use a mandolin to finely slice the courgettes, then roughly chop them afterwards. Don't make the pieces too small, as they will need to help bind the fritters. Transfer to a large mixing bowl, then finely chop the shallots and flat leaf parsley. Add to the courgettes and crush in the garlic. Finely slice a spring onion and add that in too. Add the cumin, turmeric, cinnamon, salt and pepper then mix all the ingredients together. Turn the oven on to about 150°C and bake for 20 minutes. If you want to eliminate the baking stage you can deep-fry the fritters, but I prefer to adopt a slightly healthier and less greasy method. Serve warm, 2-3 fritters per person, and spoon the yogurt sauce on top. They sound delicious. I loved the first book and have just borrowed Plenty so I'll see what I can play with!